at this moment im using a simple covenant gear from the pvp vendors. covenant bands help give 3 extra meters for bow, fire resist glyph helps out, two handed mace with disease, and bow with poison. vampire for magicka and stamina recovery plus for the extra mobility buffs. This build was created in honor of the former glory to the reapers mark skill that once did ignore 75% of armor for both caster and enemy hence "the Reaper". Even though the skill was changed over a few past updates, the power that it once held is still within the game. In fact its power is sealed within 5 skill trees. 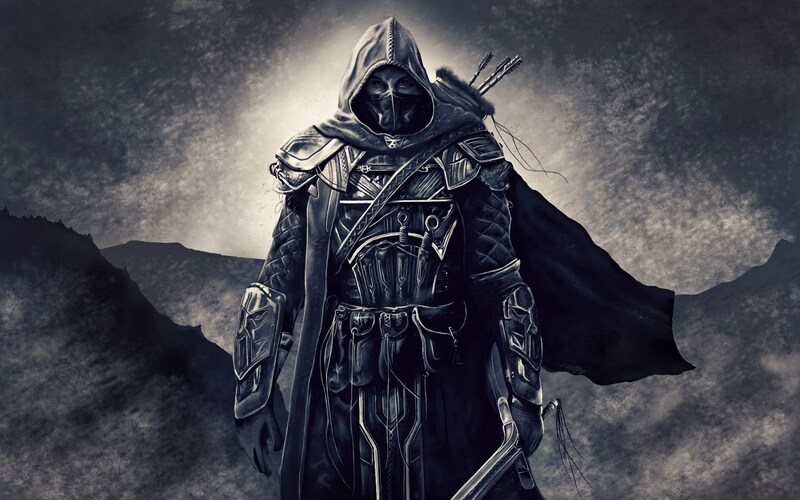 Assassin, two handed, bow, Enchantment, and the champion system. This builds main goal is to ignore as much armor as possible and to combine it with both crit and dps. If done correctly your enemy can fall within 3 to 5 seconds. First you must always start in stealth mode and make sure rally is up for both healing and damage buff. switch to bow and concealed weapons passive will work automatically with vampire to give mobility to close to 25-30 percent without using other skills to buff up your speed. Now once you see a target make sure focus aim is first to fire and when your arrow is airborne, cast piercing mark. Make this a habit because in that order piercing mark is calculated first before the arrow hits. this gives you few precious moments to get a head start in your dps/crit. If you do the mark first then your target gets a warning sign that your present. You want to reduce the enemies reaction time as much as possible. Next fire poison ejection and both poison glyph with ejection will help out with DOT. Switch to the mace and right from switching you get ignore 20 percent of armor for wielding a 2H mace. The disease glyph will reduce any healing your enemy tries to cast on themselves. Use critical rush and once you hit them then cast mass hysteria. As fear over comes them do wreaking blow to get the added damage buff from the skill. Finally executioner will finish them off. Sometimes you might have to switch of wrecking and executioner to kill the target. in some cases you can fully use the bow to end them with the 23 meters between yourself and them. Clouding swarm helps me so that the player doesn't see how im attacking which can help if they are trying to predict my moves. this build is very flexible if other skills are more to your liking. Now for the math to show how much The Reaper build reduces the armor. Example : armor 17000 2H mace ignores 20% of armor 17000x.2=3400 17000-3400=13600 percing mark 5200 focus aim 1170 5200+1170=6370 13600-6370=7230 optional Enchantment crushing armor. (update reduced amount) 847 for purple glyph 7230-847=6383 champion system at the moment I have piercing at 12 percent and this can go high over time. 6383x.12=765.96 6383-765.96=5617.04 17000 from 5617 is a 67percent decrease. very close to the old reaper skill of 75 percent. Yet the champion system isn't finished yet, I believe it can reach or even surpass 75 percent. Even with all of the armor reduction the basics to being a Nightblade still applies. Attack when the moment is right, choose your battles carefully, watch your surroundings, flee if necessary, and always stay in the shadows. stamina is the main focus to keep up with the dps. Under the ritual just concentrate with piercing for extra ignore armor. remember once u reach at least 32 points for one perk, the percentage value takes longer to go up so lean to other perks to help out the overall dps, like Might for damage. Also, mb, “Reaper Mark”, not “Piercing”?